Other than the Bible, the single most written about and quoted body of work in the world is that of one "William Shakespeare." His writings have not only set the standard for every play and poem that has followed, but his massive vocabulary, fully two and one-half times that of the next most linguistically-gifted writer, has had an unparalleled influence on the English language. Yet, for many theatergoers, attending a Shakespearean drama is a trial. With the passage of more than four hundred years since the plays were first performed, the language and historical context of the period is receding from our everyday understanding. On top of this, the author to whom we attribute these 37 plays, a collection of sonnets, and various epic poems, is a mystery to us. It follows, then, that directors and actors often approach their work without a clear grasp of the playwright's intent. It is of the utmost importance that we do not allow these misperceptions to continue, for understanding the context of this genre is as integral to its presentation as theatre is integral to our spiritual health: Theatre remains the nearest art form we have to the soul-searching Paleolithic rituals that represent humankind's innate means of integrating the forces of the natural world with those of our psyche; through theatre we center ourselves. Among the many great playwrights who have created theatrical rites that successfully accomplish this mystical psycho-spiritual gestalt, the one we call Shakespeare remains foremost—the name itself continues to denote the epitome of the dramatic arts, despite the quality of many Shakespearean productions. Yet, who was this man? What greater elevation might we attain from the experience of his plays if we actually were able to end our uncertainty over his life? Was he a glove-maker's son, a ruthless grain dealer, a part-time thespian who had difficulty signing his own name the same way twice, whose last will and testament mentions no theatrical properties or books, and whose own parents and daughter were illiterate? Or, was he a man whose uncles were responsible for the first English translation of Ovid's iambic heptameter Metamorphoses (all the sections of which are quoted in the canon) and the never-before-seen-in-English forms of the sonnet and blank verse, and whose family, close acquaintances, and travels are specifically detailed in his writings? In begging this question, my position on this matter is clear. Suffice it to say that I have reached this point-of-view after much study of the historical evidence and observance of the internal logic of the plays themselves. For this reason, when referring to the body of work formerly attributed to a William Shakespeare (or, Shaksper or Shakspere, take your pick, since he was unable to consistently spell his own name), I prefer calling the Stratford man "Shaksper," because, signing his name in this manner illustrates the slipshod communication style of "the swan of Avon," clearly showing he could not be "Shake-speare." Also, note that no forms of the 83 versions of this family name listed in Britain during the Stratford man's time contain a hyphen, as does de Vere's pseudonym, when it was first employed). 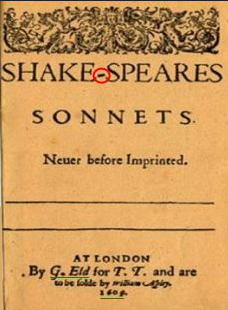 Thus, I use the term Shakespearean, to denote a genre, and not to reference anyone whose name happened to resemble that of another man's nom de plume: "Shake-speare," as it were, according to "the true and original copies," as the First Folio, published by de Vere's daughter, puts it. By this I mean to say that the name Shake-speare was a deliberate construction used to represent Edward de Vere, the 17th Earl of Oxford, who could not, because of his family's position and other court politics, "write for attribution." Others had used variations of the hyphenated term to extol Oxford's talent, so it was only natural that he use this variation both to conjure Pallas Athena (the patron goddess of Greek and Roman drama), the spear-shaker, as well as to reflect his crest as Viscount Bulbeck, which exhibits a lion brandishing a broken spear, not to mention his heredity guardianship of the oversized ceremonial sword-of-state, as Lord Great Chamberlain. In 1592, Thomas Nashe, one of de Vere's literary acquaintances, wrote a poem to "Will Monox" (Will, mon [my] ox [Oxford]): "... has thou never heard of him and his great dagger? "—that is, the massive sword. This was the first public association of de Vere with "Will." In the same year, Nashe says "Pierce Penniless" (the bankrupt "speare") is the author of Venus and Adonis. (Nashe is Moth in Love's Labor's Lost) In 1593 (age 43), de Vere ceased publishing under his own name, the same year that the name William Shake-speare first appears, as the author of the epic poem Venus and Adonis. (Michael Satchell, "Hunting for good Will," US News & World Report, July 31, 2000, pp. 71-72.) Thereafter, the hyphen begins to appear in publications of the plays (1598) and poems. Before 1598, all plays are published anonymously. 1578, Gabriel Harvey (Holofernes in Love's Labor's Lost), a fellow of Trinity College, Cambridge, praises the Earl of Oxford (in Latin) with the words "Thine eyes flash fire, thy countenance shakes a spear." 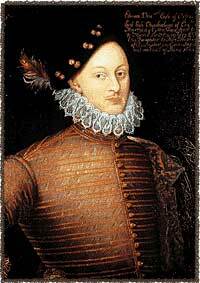 1589, De Vere was a courtly poet and playwright who, as noted in The Art of English Poesie, would be recognized as perhaps the finest of his age "if [his] doing could be found out and made public with the rest." 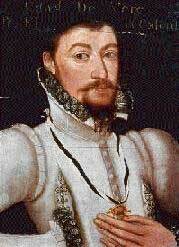 1589, George Puttenham writes, "... I know many notable gentlemen in the Court that have written commendably, and suppressed it again, or else suffered it to be published without their own names to it: as if it were a discredit for a gentleman, to seem learned." 1598, Francis Meres writes in Palladis Tamia, "Noblemen and Gentlemen of Her Majesty's own servants, who have written excellently well as it would appear if their doings could be found out and made public with the rest, of which number is first that noble gentleman Edward Earl of Oxford." And "... the best for Comedy among us be Edward Earl of Oxford." Further, this book specifically addresses poets with pen names. Yea, this I know I may be bold to say, Thames ne'er had swans that sung more sweet than they. It's true I may avow it, that ne'er was sung. Chanted in any age by swains so young, With more delight than was perform'd by them, Prettily shadow'd in a borrowed name. And long may England's thespian springs be known. Translation: Let me tell you, London never saw writers more gifted than the ones I saw during the reign of Queen Elizabeth. And never were there more delightful plays than the ones performed by youth whose author wrote under a borrowed name. Circa 1650, John Ward, a vicar from Stratford-on-Avon recorded in his private diary, "I have heard that Mr. Shakespeare ... supplied the stage with 2 plays every year and for that had an allowance so large that he spent at the rate of £1,000 pounds a year ..."
Yes, de Vere was awarded the second highest annual stipend on Elizabeth's list (only James of Scotland, who followed her on the throne received more) to write the history plays. The Stratford man's estate never exceeded £350. Stratfordians are thus clueless when it comes to Antiphalus of Ephedus' comment in A Comedy of Errors: "A thousand pounds a year, I buy a rope." The irrepressible speare-shaker, de Vere, also used this alias and others to put forth his ideas on both secular and church matters, at Elizabeth's request, in various pamphlets and homilies. I am certainly not the first to doubt the Stratford man's potential or, going further, to believe that de Vere is the true author. Among those who agree on one or both of these points we can count Walt Whitman, Henry James, Ralph Waldo Emerson, Mark Twain, Sigmund Freud, Orson Welles, Leslie Howard, John Geilgud, Mark Rylance, Michael York, Kenneth Branaugh, Derek Jacobi, Keanu Reaves, and Justices John Paul Stevens and Harry Blackmun. But enough has been written about the authorship question per se, and it is not my intent here to revisit this ground. If one reads only Charlton Ogburn's The Mysterious William Shakespeare: The Myth and Reality, the arguments absorbed therein would be sufficient to end all debate. Of course, there are many other well-researched and reasoned books and monographs that add to the Oxfordian proof, most notably the recent biography, Shakespeare by Another Name, by Mark Anderson. This is not to slight the duteous and well-meaning scholarship by Stratfordians and advocates for other candidates, nor even the imperatives of the industries (both academic and commercial) that have staked their livelihoods on the Stratford man, nor the well-publicized debates between scholars, as seen in the past decade in Atlantic Monthly or Harper's, nor even articles in The New York Times and U.S. News and World Report that highlighted the facts in favor of the Earl (not to mention the 2013 public television documentary, Last Will. & Testament, produced by Mark Rylance, Derek Jacobi, and Vanessa Redgrave). We must also stress that we sympathize with the Stratfordian argument that choosing Oxford over Stratford reveals class prejudices; however, we believe that Oxford's authorship proves the opposite: awareness of the details of the education afforded Edward de Vere can only help deliver a comparable syllabus for the masses, much as emulating key parts of Leonardo's education would also benefit human evolution. But even without the "smoking gun"—the heavily annotated Geneva Bible of Edward de Vere that references the bulk of the biblical allusions in the canon, and which (an exhaustive mathematical study has concluded) serves as proof of de Vere's authorship—the facts are so overwhelming as to convince this writer that my time is better spent enjoying the extraordinary plays and informing my experience by the details of de Vere's life: For by increasing our understanding of the author and his milieu we not only increase our appreciation of his work, but position ourselves to benefit to an even greater degree from the productions and performances that are similarly informed, thereby enabling our transformative theatrical experience to achieve its fullest possible flowering. So, in the reviews of Shakespearian productions on this website, I hope to show you how facts from de Vere's life can enhance a production and your experience of a play. This opportunity delights me to no end, since the ultimate proof of Oxford's authorship is in the pudding, that is, in the plays themselves. For many of you, these works are well known. You know what happens and you know when it happens, but you revisit the plays because the words and dramatic craft are so superior that you never cease learning something from them. Thus, any discussion I may present on key actions of the play won't distract from your experience, but inform it. Also, I will discuss key moments in the drama so that you can better judge the effectiveness of the re-enactments you witness. Did the director and actor give you a Hamlet whose motivations are understandable, or did they choose to make him mad and indecisive? Is Shylock evil, or is his behavior a mirror to the Christians who abuse him? Why do so many of the plays contain the theme of marital infidelity? Finally, by explicating the plays in this manner, and by drawing parallels between issues in the plays and current events, I hope that my reviews will stimulate you to ask additional pertinent questions, for one of the delights of attending theatre is to discuss the action and content of the play not only for its own sake, but for its relevance to our own lives. And that is really the point of Oxford-centric reviews—to further our enjoyment and appreciation of the greatest body of work in the history of theatre, and to stimulate our spiritual growth through these universal experiences. Nota bene: For our review of Roland Emmerich's film, Anonymous, based on the life of Edward de Vere, click here. For an example of a review of a Shakespearean tragedy (Romeo and Juliet) from the Oxfordian perspective, click here.